Christ the King church is in the townland of Shanabooly. 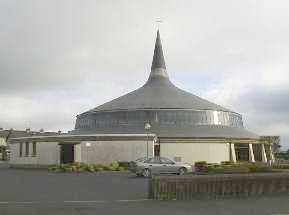 It was opened and blessed on September 27th 1985 by Bishop Newman and Fr David Houlihan PP. The architects of the church were John and Nuala Kernan. The church is now a listed building. The builder was Pat Cullen and the engineers were Michael Punch and Partners. 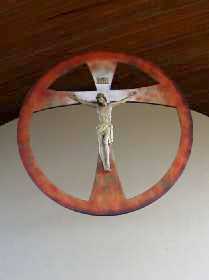 The church is circular in shape and has a high timber ceiling. In the main porch, there is a picture of Pope John Paul II celebrating mass at Limerick Racecourse during his visit to Ireland in 1979. 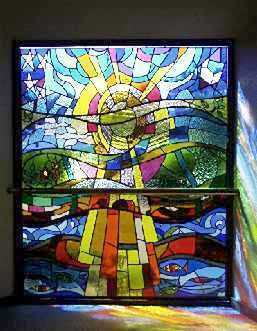 A stained glass window depicting the story of Creation according to the Book of Genesis is in the porch. Erica Ryan designed this window. It is dedicated to the memory of members of the Kiely & McDonagh families and was erected by Kathleen McDonagh. There is also a statue of Our Lady of Tenderness & Mother of the Church, which is in memory of Fr John Ryan who was parish priest from 1992 until 1997. Chris Ryan made this statue. 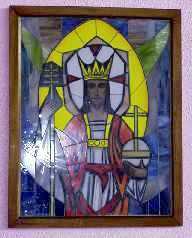 It was placed in the porch of the church in the autumn of 1998. 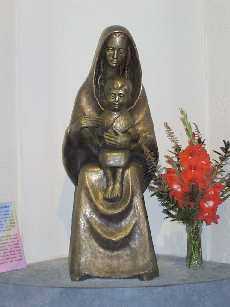 Beside this statue is a plaque which lists the donors of items to the church. There are eight stained glass windows on the left-hand side of the church. 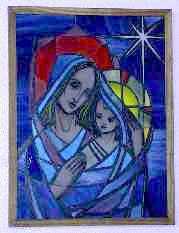 These windows are echoes of the stained glass window of Genesis, which is in the porch of the church. To the right of the altar, there is a picture of Mary and the Infant Jesus while to the left there is a picture of Christ the King. The high altar is made from a combination of concrete and granite dust. The altar stone was formerly part of a nineteenth century altar from the Benedictine monastery at Glenstal Abbey in Murroe, Co. Limerick. Behind the high altar, there is a separate chapel of reservation to the Blessed Sacrament. 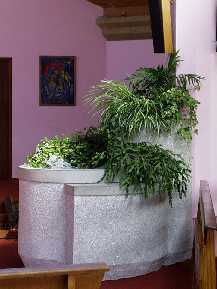 Fr Henry O'Shea, a member of the Benedictine Order designed the large stone baptismal font, which is now situated to the right of the high altar. 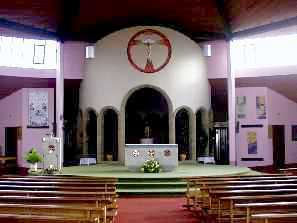 He also designed the altar, the ambo, and the tabernacle. 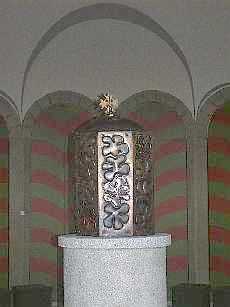 The tabernacle is made from copper. The hanging crucifix, which is situated over the main altar, and the President's chair are both Fr O'Shea's design. We would like to thank the architect of Christ the King church, John Kernan for providing us with information on the church.